Review written by @Jnes5 and edited by @Ichigofan. It is the year 511 of the Unified Era in the continent of Imperia, which began after the War of Unification, which was meant for the realms of Athos, Elyria, Thena, Certes and the Vestra to unite and form the land of Imperia, has ended in success. A new war, the War of Independence, is occurring between Athos, Certes and Thena joining to face against Elyria in order to gain more territory from them. But as years have passed, the war was calmed down a little and since then, the Elyrian kingdom were having their traditional Harvest festival event until an incident occurs as the chosen one to sing in the main festival, Elena, becomes cursed and transform into a hideous beast and wreaks havoc upon the city. Aeron, a friend of hers, later finds her unconscious and returned to her human form next to a Vestra merchant named Mavda, who helps them escape from the city and from the Elyrian army and eventually reach the wastelands of Okanos, where a fortress known as the Thirteen Towers is located, over a massive chasm called The Scar, which was caused by a violent event called The Cataclysm and is only stopped from growing bigger and engulfing the world by the Thirteen Towers, where it is suspended in the middle of the chasm by twelve chains connected to the surrounding cliffs. Mavda reveals that she has seen Elena's curse before and that in order to lift it, Aeron must use the Oraclos Chain, a special weapon given by her, to obtain the flesh of the monsters that live in the Thirteen Towers. Although Elena will be returned to human form after eating the flesh of any monster in the tower, Mavda tells them that the only way to truly remove the curse is to retrieve the flesh of the 12 Masters of the Towers. I do think that the story in this game is pretty good, although it lacks on certain areas, the whole setting to the whole world is not covered enough to know more about them, such as the empires in war towards Elyria and even how they even are or look like, it lacks a lot more background behind the whole setting and you even need to pay close attention to some details that the game might give you regarding the whole background of its setting to try to understand what is going on in the world... however, the game is still fine aside from the lack of background since the main story, which focuses on Aeron saving Elena from her curse from spreading any further, is presented very well, as you continue towards the game, there will be notes laying around that can give you much more on the background on the towers and even the war that happened years ago in the game's current time, as well as the character Mavda giving you a bit more of background from her casual talks to giving you notes detailing what's going on in the world, the game also gives you hints and mysteries throughout the game that of a side plot that will affect the main story at the final climax of the game, one of the hints that lead up to more of the background related to the main story is very well told while the other hints that is also in the same main story is kind of predictable, although still well done, the main story is very interesting and with the hints and mysteries that the game will give you later on, but it would've been more appealing as to where you want to know what will happen in the end of the story if the character development was better (more on that later on...). 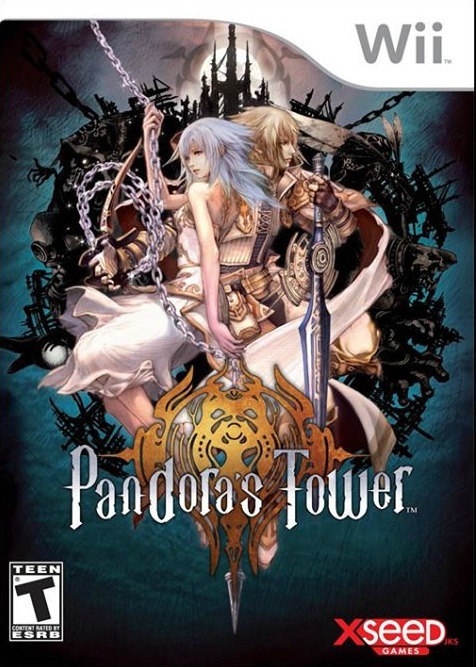 Pandora's Tower (also known as "Pandora's Tower: Until I Return to Your Side" in Japan) is an Action game with Role Playing elements that can be played with the Wii Remote + Nunchuck and the Classic Controller/Pro, The main objective of this game is to explore all 13 towers filled with many monsters and defeat the bosses in each tower and collect their flesh, but you also must return to the observatory every once in a while to keep Elena from turning into a beast by giving her any type of monster flesh while also strengthen your relationship between you, as Aeron, and Elena. The controls might be a little complex at the beginning, but it will be much more simpler later in the game, you attack with the A button and with the Z button in the Nunchuck you can defend yourself if stationary and you can roll out if moving and pick up items with the C button, there's also a helpful menu that you can open up with the + Button where you can manage and see the inventory, equip some armor, weapons or such, look at the map, etc., two interesting things to mention is that you can use any usable items by scrolling with left and right on the D-pad on a small menu and use that select item with either up or down on the D-pad, and the other one is what makes this game unique which is the Oraclos Chain, this chain can be helpful in ranged distances by aiming with the cursor with the Wii remote and when highlighted on an object or monster you can tap the B button to quickly grab it, hold it or attack it, but you can also hold down the B button to make the cursor have a little zoomed-in view of where you are pointing to where you can aim in great detail what you want to grab, this might sound troublesome when in battle, but the big advantage is that the game slows down when doing so, meaning there's no regrets of ever using this feature, but when the chain grabs something, you either pull it by holding down the C button or by violently pull it down by shaking the Wii remote downwards, you can also attach two objects with the same chain by pointing it to another object and pressing the B button while the chain is currently grabbing something else, you can even reach some items from a far distance with it. The controls feel well, there are also some other mechanics included in the controls that are also helpful that I will mention later like jumping where it's automatic in which once you run towards a gap, and there's another platform towards you, you will jump to it, however I did have a problem with shaking the Wii remote down in order to pull out something violently, as in sometimes it might work but sometimes you might need to shake a little more harder in certain times, and this can get bothersome if you are fighting with a lot of enemies, but other than that, the controls are good despite some little issues, but you can also use the Classic Controller/Pro in this game, replacing the whole aiming with the Wii Remote to aiming with the right stick as well as replacing the Oraclos Chain's controls with the R button, one issue I have is that the controls in the Classic Controller/Pro might be awkward to get used to and might take some time to be comfortable with it when using the chain, especially if you get used to the Wii Remote + Nunchuck, but it is great for those who don't want to aim and shake on the Wii remote and Nunchuck, making this game feel much more accessible to anyone in terms of controls. 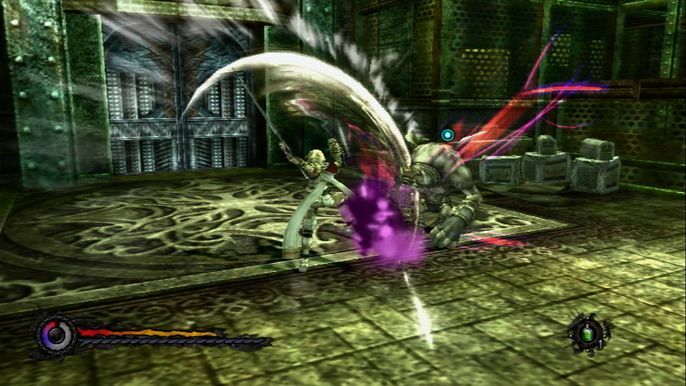 This being an action game, the combat feels amazingly fluid and comfortable since dodging in this game actually feels like you are dodging attacks unlike other action games where dodging was useless since they can't even help you evade an attack, especially if it didn't hit you (sadly you can't constantly spam the dodging move since the game will punish you by making you vulnerable if you do it two times quickly, but to me it's a fair mechanic), there are also other mechanics that you can do in which there's a charge attack you can do by holding down the A button and then let go, you will also see a visual cue when doing a charge attack where you see a circle closing towards Aeron and when pressing the A button when the circle is almost gone, it will help Aeron to pull of more combos from the charge attack, the Oraclos Chain is even useful for battle in some cases, since you can use it by specifically point the enemy towards a certain limb to grab it and then violently pull it off, slightly damaging it, and you can get certain items from them by defeating them and when they're lying on the ground (with some red mist coming from them indicating they are defeated) and then aim which limb to take from, and then once the chain grabs it, you violently pull it off, you can get certain items from them but if it's in the stomach (in most enemies) you will always get the monster's flesh in which it will be useful for a certain situation (more on that later...), the chain also even has its own meter that that determines how much damage it can do when violently pull off someone and you can raise it if you use the chain in different ways but in a quick consistent way as it can slowly reset to zero if it doesn't do anything, it's meter can also be upgraded by defeating a boss, it's a pretty nice action game but it also has a great amount of RPG elements on it, for example you can level up your character by earning enough experience points by defeating enemies, you can level up your health meter, your attack power, etc. one RPG mechanic to mention is the inventory and equipment menu, in the inventory menu you are limited to carry a certain amount of items depending on how much your bag can hold, at the beginning it is very frustrating due to how low it is, but you can thankfully make Elena help you expand it with a certain item, and the equipment menu is sort of the same in terms of its functionality, there's a grid menu where you can set the equipment on them and take some space and the bigger the item is, the more space it will take, so you have to arrange them in order to make the equipment to have a little bit of more space by turning them or such, think of the item menu in Resident Evil 4, only much more smaller and you can't combine items and such, but you can upgrade its space by leveling up which is a good thing, speaking of equipment you can also acquire two new weapons eventually in the game aside from the sword, one which is more quicker to swing but very weak to use and one that has a great attack range but it is slow to swing, and all of your weapons can be upgraded to become more stronger with the help of Mavda by bringing her certain types of material items. And speaking of items, it has a great emphasis on the game as there's many types of items located inside the towers that you can use in a different way, you can find them by destroying some crates, find them in a certain spot or by finding the in chests, which said items are usable items, the equipment items, etc. but the most that gets more attention is the material items, since in this game you can also find items that you can use to create items of any kind with the help of Mavda, you can create usable items, gift items, more material items and also be used to make your weapon stronger as I've mentioned before, the game can get difficult if you don't use this mechanic often in order to help you out in the game, as I had trouble in a few dungeons due to not using this mechanic well and not often, but thankfully I did use it well and often later on and I had the choices of how I am going to play the game (better attack power, better defense, better range, etc. ), some material items can each be found in a certain tower, meaning that you might go to a certain tower in order to get a certain item, but I think that is for completionists since I did fine and I didn't needed strong weaponry (but I did needed strong armory which can be obtained easily) to beat the game, but other people might struggle in order to get their equipment they want. The towers are the ones you must explore and reach to the top, the exploration in this game can differ in each dungeon, but mainly it composed with rooms where it can be full with few or more enemies, which there's is a nice variety of them (both common and special) and each special enemy is unique to represent the tower they're on, and some rooms might have a certain mechanic that might help you progress through the tower with the help of the Oraclos Chain, for example there are elevators that can be operated to go up and down by operating a lever by using the chain from a distance if the lever is a little far away and there are some helpful structures that you can grab and help you in some way like the ladders that you can grab a part of it to get on to it and some hooks on the ceilings that you can grab to either hang onto it or swing back and forth in order to later jump towards another unreachable platform, and each tower has a different mechanic between each other that can be operated differently in order to progress, for instance there's one where you must operate a giant waterwheel in order to grab its handles sticking out of its sides in order to reach the next unreachable floor and there's one where you have to grab some stones that are sticking out of the walls in order to get higher to the tower, but the towers each have uniquely designed obstacles in some rooms that differentiate from others as well, for example there's one where you have to jump quickly over some stones they fall down the lava in a fire based tower. 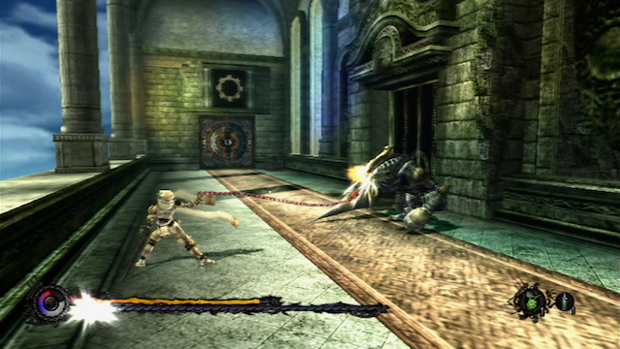 All of the towers though have a giant door at the top of the floor where the boss is inside, and the only way to defeat them is by pulling their master flesh out of them, however all of them have a massive health bar and the only way to hurt them is by making them expose their master flesh (since each boss have a unique way to fight them as they have different patterns and behaviors that you must attack them in a certain way to make them expose their flesh) and once exposed you must remove it with the help of your chain by making it stronger (which you can do that by pulling them for a while and then, at the right time, violently pull it down) and the more stronger it is, the more health you can get rid of, it is a great and fun game design but the thing is though the giant doors that lead to each of these bosses is locked up with chains, and these chains can be found in special rooms located throughout the tower by pulling the door's lock with the chain and then when inside, you destroy the chain with your weapon, so it encourages you more in exploring rather than reaching the top of the tower, but thankfully the whole towers do not have a very complex design that can take you very long to beat (the later ones might be but you might get used to the whole game to not take too long), and I say this because you have a time limit in these towers. The game is not just about exploring the towers, it's about keeping Elena from turning into a beast, there is a gauge that acts like a time limit in the bottom-left corner of the screen that represents the amount of time left for her to turn into one, shaped in a circular form with three colors filling the gauge (white which means she's alright, purple which means half her body is going to change, and red which means almost all of her body will be transformed) and when time decreases, the gauge will decrease while staying in one of the colors where Elena's progress will be in, sadly you can't stop the gauge, you have a rest area which is the observatory, and inside there are a lot of helpful things (it even stops the timer until you go to a tower) such as a save point, a big chest that you can keep your items in and Mavda where you can talk to her and help you by offering her shop, strengthen your weapon, craft some new items, etc., and she can reward you some gold (in here they're called leots) if you bring her some notes or some spare flesh that you want to get rid of, and there are also some rooms in the observatory that can be visited and maybe find some items every once in a while, but the most important one in the observatory is Elena, and what you need to do to keep the gauge from decreasing is to feed her with the enemies’ flesh as I've mentioned before, and the monster's flesh comes from four varieties, one which is the master one that can recover Elena completely, but they can only be pulled from the bosses and are required to continue the game, but the other three are more common since they come from the enemies in which are the normal flesh that can only gain you a little bit of time, the dripping one that can give you a decent amount of time, and the pulsating one that can give you a great amount of time. But there's more, you not only keep her from turning into a beast, but you must also strengthen your relationship with her by giving her gifts (that can only be obtained by either buying them from Mavda's shop or by crafting one in Mavda's workshop) or by selecting the correct option when she asks you a question by talking to her, but you can weaken her relationship by giving her the wrong items or if you answer the wrong question, and you relationship is indicated on a meter above the time limit that that is only seen when you're in the observatory and the higher the meter is, the more better the ending is going to be as I've mentioned before. 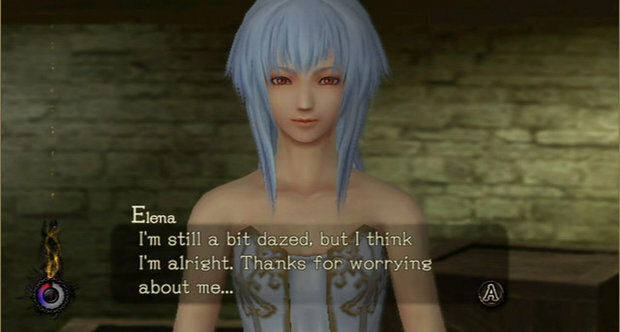 Responsibility plays a great role in the part of the gameplay, as you not only must explore the dungeons, but you must also keep Elena from turning into a beast, otherwise it's game over and you will get the bad ending, but you must also keep your relationship with her as well, in order to affect the ending in the end, and for some reason the whole responsibility did not affect my enjoyment of the game, I did get used to it in order to get through the game, however I do think that some people might find this very tedious and a chore to do to play this, while the game is designed well in order to not be too long, the game does get harder in the later dungeons and some people might not have the patience for their responsibility to be much more difficult. I thought that the game was good, despite the fact that the game has a time limit and some other issues, I do think that the responsibility is a strong focus in this game and the controls feel really good despite some issues and not to mention that the game is designed well in other to balance some of the issues like the time limit and the responsibility to be much more acceptable as you are playing, and it was enjoyable to me due to how strategic it can be despite not having any strategic mechanics in the gameplay, however I do think that some people might get frustrated with this game due to the responsibility and the other tedious issues like the item collecting and such. The soundtrack is very good, it has an orchestral score for all of its songs and in some of them they have choirs as well to accompany the music, although it needed a little bit of attention to be somewhat memorable since some of the songs are pretty quiet and the gameplay pretty much distracts from it, there is some songs that really accommodate some moments such as the boss battles, the important events, etc. and they all sound amazing and do a great job at setting the mood of the scene. The sounds are somewhat very simple, most of them sound a little low-budget but for some reason they really fit well with the game, like the sword slashing, the ground being pounded, etc. but there are some sounds that are very nice that fit appropriately like the tensely-heard heart beat and others. The voice acting in this game is really great, although Aeron doesn't speak much, the voice actor Ryan Philpott does his best for the role and he is good at it in the end, Charlotte Sanderson as Elena is pretty good although I wanted to be it a bit more better since there are moments where she sounds a little quiet due to the music being loud at times or due to some other issues, but she does a great amount of effort into her role since the game has Elena so much to talk about when talking to her or giving her gifts and such, but the best one by far is Ann Beach as Mavda, she sounds perfect in this game, Mavda being an old woman and very mysterious for the other characters, the voice actress does the greatest job at portraying her at who she is, the other voices are fine but these three in which are the most important do a great job at this game. And also this game actually supports all common languages like Spanish, French, etc. but they are only subtitled as the voices are only in English. Despite only the game being set in one place, the game does a great job at giving the towers that you visit an interesting and different design that doesn't make itself look repetitive, for example there is a tower with a green and forest nature-like environment, a blue and water based environment such as waterways and a giant waterwheel, etc. and each tower represent their uniqueness with said environments and a game design that takes the environment and integrates it into the gameplay, meaning that the towers feel very "alive" and they are interesting to explore it, and even when not in the towers the observatory can have its moments too, while it doesn't have any secret rooms to explore, it does have some rooms that look really great, for example at the next room of the main observatory you can go a spring-like tower area and it look very pretty to look at, everything in this game along with its setting feels great and I do feel that in this section it is very well polished. Be warned however that for those of you who want to complete this, there is a bug in the game that will make this game freeze in a certain moment, it won't happen to those who want to simply beat this game though, but in this link there are more details about the bug and how to fix it (without the need of a hack or a patch). There's a potential flaw in the Wii U version of the game that can cause the game to freeze 100% of the time if you leave the fourth tower before completing it, this flaw seriously hurts the game's overall score, the Off-TV-Play on the other hand is definitely a nice addition to the game! I'm not going to lie, I didn't read all of that, but I do agree with the score as the Wii U virtual console release is messed up in a big way. I'm sorry to hear that the virtual console release is broken. How could this game possibly have new glitches? I thought that the Wii releases on the Wii U eshop were unaltered Wii games running through Wii mode on the Wii U lol? If there are Nintendo probably broke the game censoring something that they deemed inappropriate lol. That's unfortunate. I've never played this title, but such a big bug is enough to put me off completely. It's part of the reason I never tried Skyward Sword. @GeekyGamerZack But there's a patch on the Wii Shop that you can download that gets rid of the bug in Skyward Sword. @Rena Ryuugu Fanboy wrote: But there's a patch on the Wii Shop that you can download that gets rid of the bug in Skyward Sword. I know, it just seemed like such an inconvenience. There were other reasons as well, but I can't remember what they were. @GeekyGamerZack It's still a great game. It sounds like the developer did something to mess up the coding of the game. Such a shame.